On behalf of the WP60 Committee, good evening and a warm welcome to all. Late last year, the Workers’ Party’s Central Executive Committee set up the WP60 Committee to commemorate the 60th anniversary of the party. Sixty years is a long time in the history of any political party. The biggest issue for the WP60 committee was how to capture the memories and footsteps of the party in an appropriate and meaningful manner but yet, without embellishing and filtering difficult moments. With this in mind, we quickly set about our task and resolved to give the various sub-committees and task groups as much latitude as possible in determining how they wished to proceed. I have spoken about the various activities that were conducted over the course of the WP60 celebrations during the official opening of the new WP HQ on 29 Sep 2017 – these included organising a community walk, reaching out to less fortunate Singaporeans, hosting a WP60 exhibition and National Day dinner, and publishing a commemorative book which I will leave Daniel to speak about later. Rather than go into each of the these activities, which many of you here today experienced and supported wholeheartedly – something the Party is very grateful for – I want to share my thoughts on the party’s road to WP60 and the stories of some individuals that made today possible. WP60 is also about those individuals, no matter how small a role they played – all of whom are all individual parts of a jigsaw that has made the Workers’ Party what it is today. Without them, the jigsaw would be incomplete, and strikingly so. Shortly after David Marshall left the party in 1961, the party went into limbo. Until it was revived by JB Jeyaratnam in the early 1970s, two men endeavoured to keep it alive as an ongoing concern. They were humble pastry chefs. One was Lim Ee Ping, who we are honoured to have with us today and the other was Chiang Seok Keong. I can only imagine the expressions of futility many must have hosted for such a small political party in Singapore’s political landscape. But without the efforts of these two pastry chefs to keep the Workers’ Party alive, the Party may well have ceased to exist much earlier. When I joined the party in 2010, I came to know of a small group of newer and younger members who exhibited tremendous initiative and enthusiasm in organising activities for the Party. They included Ng Swee Bee, Lee Lilian, Kenneth Foo, Melvin Tan, Koh Choon Yong, TT Tan, Chelsea Lu – these individuals and many like them, too numerous to name here, including volunteers and well-wishers, worked quietly behind the scenes organising party resources and living up to the saying, “talk less, do more”. They were not shy of hard and unglamorous work, and quietly slogged in the interests of the Party, not their own personal interests or vain glory. As a rookie political candidate during the 2011 General Elections, I also got to know a war horse – Jane Leong, who pulled the strings mustering candidates and ensuring the smooth running of election rallies. I did not have much contact with her then, but she had this steel about her and whenever candidates would get ready to go behind the rostrum, her eyes would transmit a call to be calm, steady and confident; and to ace the moment. Jane sadly passed away from cancer some months ago. Before he became an MP and sometime around 2010, my colleague, Faisal Manap was given a choice by his employers two days before elections for the Party’s Central Executive Committee – decide on whether you want to continue your political activism or if you want to keep your job. Faisal had three very young children at the time. When our first Prime Minister Lee Kuan Yew spoke about his entry into politics, he said he was able to take the leap because there was a Plan B; his wife’s professional occupation could sustain the family and his three children if politics did not work out for him. Faisal Manap did not have that the luxury of that choice. For many of Party members like him, the decision to climb to mountain of politics in the adverse political climate of Singapore is a lot steeper than it is for others; But in the final analysis, it is a climb that can only be conquered with the full backing and support of one’s spouse and family members. Faisal’s decision was a calling, similar to that of many who join and believe in the Workers’ Party and the importance of a strong political opposition in Singapore. In the aftermath of GE2011, many new faces joined the party, particularly those in their early 20s. Amongst many, two are well known by many party members – Yudhish and Peiying have been an important part of WP60. Yudhish represents the next generation of party activists – committed, determined, thoughtful and most importantly, hardworking. I will not take away Daniel’s opportunity to speak of all the people behind the anniversary book of which Peiying was a critical team player, but suffice to say, the book would not have been possible without them. The post-GE2011 era was also marked by some election candidates who continued volunteering and supporting the party in spite of their own busy schedules. L Somasundaram, a Temasek Polytechnic lecturer and candidate for Jalan Besar GRC in 2011 organises the Deepavali celebrations for the Aljunied Constituency Committee every year. Coincidentally, this year’s Deepavali celebrations will be held tomorrow in the Serangoon ward of Aljunied GRC. The commitment of the individuals I have spoken about did not only manifest when there was something to be done or a task at hand. As the party faced new challenges, of the then Aljunied-Hougang-Punggol East Town Council and shortly thereafter, the 2015 General Elections – many members, volunteers and supporters closed ranks and slogged through the tough times with the Party, in the trenches. They did not let their shoulders drop or lose focus, or worse, fall victim to finger-pointing and self-recrimination. They were aware that self-doubt and internal dissent was the holy grail for detractors of the Party, and precisely the outcome opponents of the Party sought to engender. Instead, these individuals I spoke about, simply persevered with steely determination even as doubts were cast about their resolve to build a better Singapore through the Workers’ Party. For all the people I have spoken about today, and the many many more that I have not, as much as WP60 has been a story of the Party’s walk with Singapore, WP60 is also about all our members, volunteers and supporters through the years, and their energies, commitment and sacrifice – something which goes unnoticed many at time. WP60 is also a small acknowledge of their sense of mission – which is to build a better Singapore, with the Workers’ Party as the tool that helps build a rational, responsible and respectable brand of opposition politics. With our people and supporters of all races and religions, we all look forward to walking with Singapore, through thick and thin, no matter what the challenge in the many more years to come. To conclude, and on a much lighter note, I mentioned at the beginning of my speech that the WP60 Committee resolved to give its sub-committees as much latitude as possible in coming up with ideas to commemorate WP60. One rather creative idea was to make enquiries about whether a Workers’ Party contingent could march at this year’s National Day Parade. The response that came from the NDP Organising Committee, was that there was an overwhelming response from over 30 social organisations and ours was not selected. When we asked what was the selection criteria and eligibility to march at the NDP, we were told that this was confidential. The WP60 committee decided to leave the matter there, but as part of the WP60 anniversary book research, a little historical gem was unearthed. 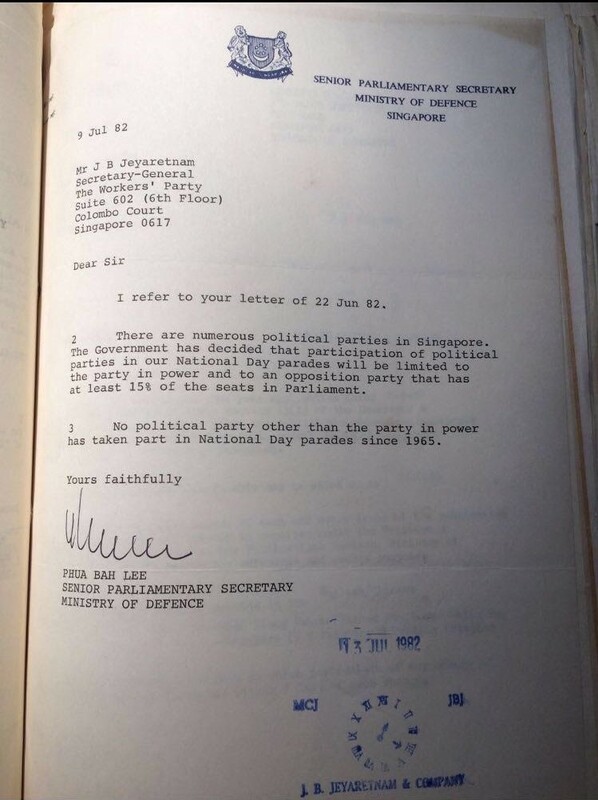 Apparently, Mr J B Jeyaratnam had also asked the Government if the Workers’ Party could be represented by a marching contingent at the National Day Parade shortly after he became MP for Anson in 1981. The Government replied formally, with then Senior Parliamentary Secretary for Defence Phua Bah Lee stating that any opposition party seeking to march at the National Day Parade would need to have at least 15% of the seats in parliament before it would be allowed to do so. If the Government sticks to its word, it looks like we have some way to go yet. But with your support and the fortitude and resilience of those that came before us and those among you who we work alongside as members, volunteers and supporters, we can get there one day but only if we remember why we serve – for a better Singapore for Singaporeans, and not for personal glory or ambition.